This tour saves you hours of research time by taking you to a shortlist of Cairo’s top sights. 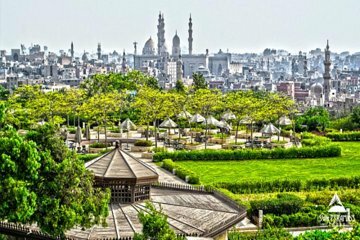 Visit Abdeen Palace, The Monument to the Unknown Soldier, Al-Moez Street, Al Azhar Park, and El Fishawi Cafe. Travel between dispersed sites in a comfortable vehicle, and enjoy the perk of having hotel pickup and drop-off included. A highlight of the tour is having a delicious dinner at Studio Masr restaurant, which boasts panoramic views of the city.